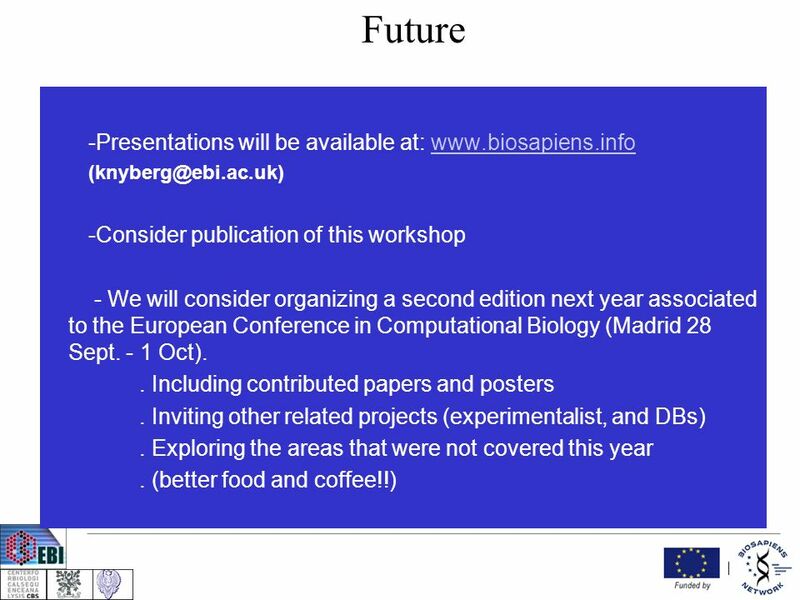 Pre-SIG meeting " Genome Annotation" A BioSapiens initiative Goal of the workshop were - to create an open forum to discuss current problems on function. 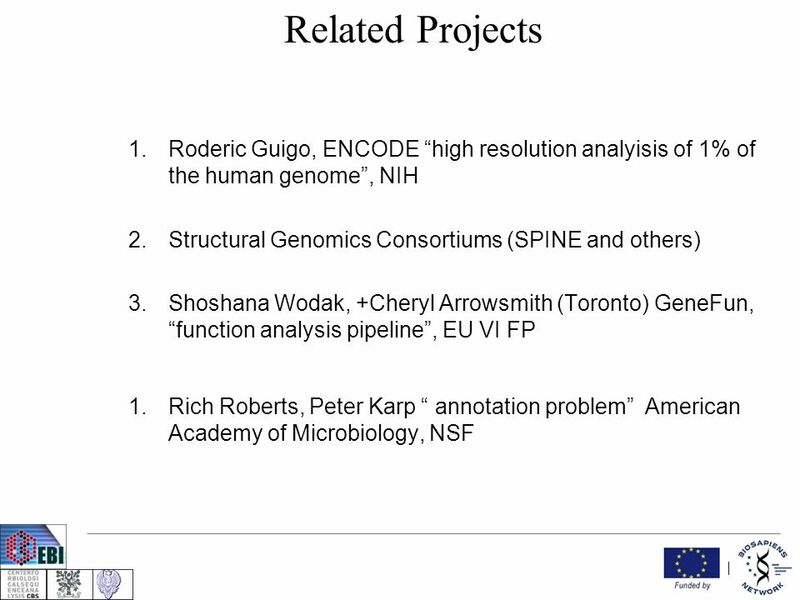 1 Pre-SIG meeting " Genome Annotation" A BioSapiens initiative Goal of the workshop were - to create an open forum to discuss current problems on function annotation, - to foster the analysis of key scientific issues in function prediction, - to promote the collaboration among scientist interested in the development of computational methods in this key area of Molecular Biology. 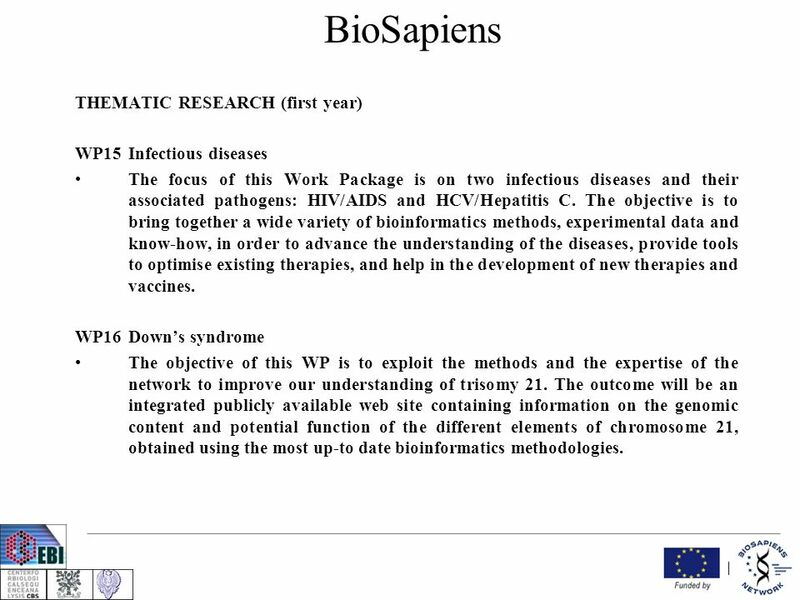 4 BioSapiens THEMATIC RESEARCH (first year) WP15Infectious diseases The focus of this Work Package is on two infectious diseases and their associated pathogens: HIV/AIDS and HCV/Hepatitis C. The objective is to bring together a wide variety of bioinformatics methods, experimental data and know-how, in order to advance the understanding of the diseases, provide tools to optimise existing therapies, and help in the development of new therapies and vaccines. WP16Downs syndrome The objective of this WP is to exploit the methods and the expertise of the network to improve our understanding of trisomy 21. 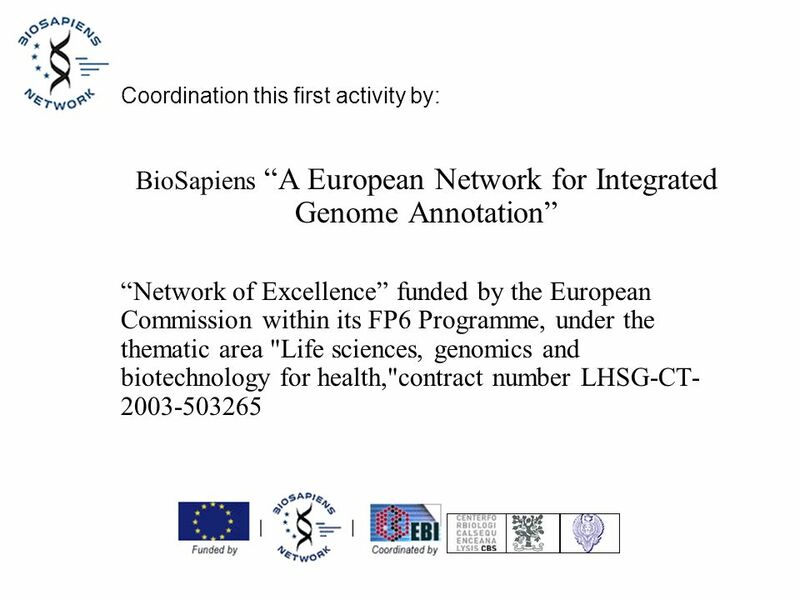 The outcome will be an integrated publicly available web site containing information on the genomic content and potential function of the different elements of chromosome 21, obtained using the most up-to date bioinformatics methodologies. 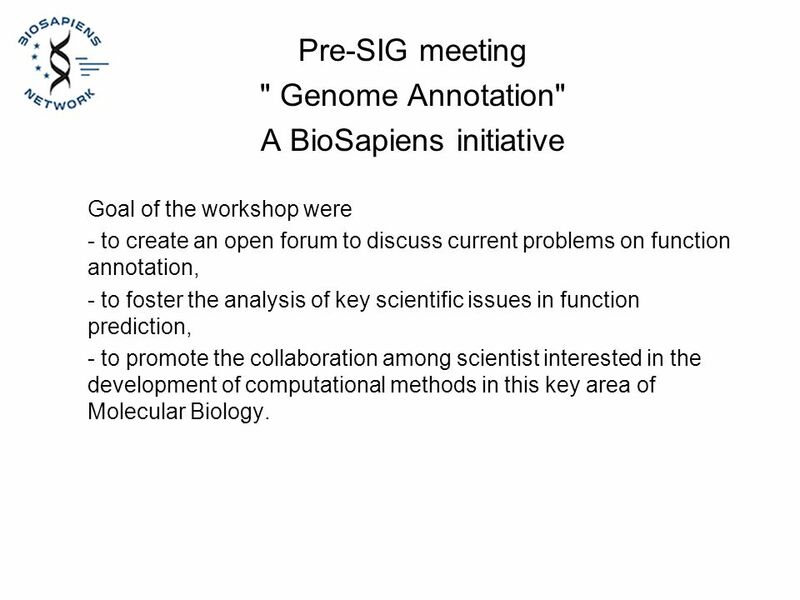 Download ppt "Pre-SIG meeting " Genome Annotation" A BioSapiens initiative Goal of the workshop were - to create an open forum to discuss current problems on function." 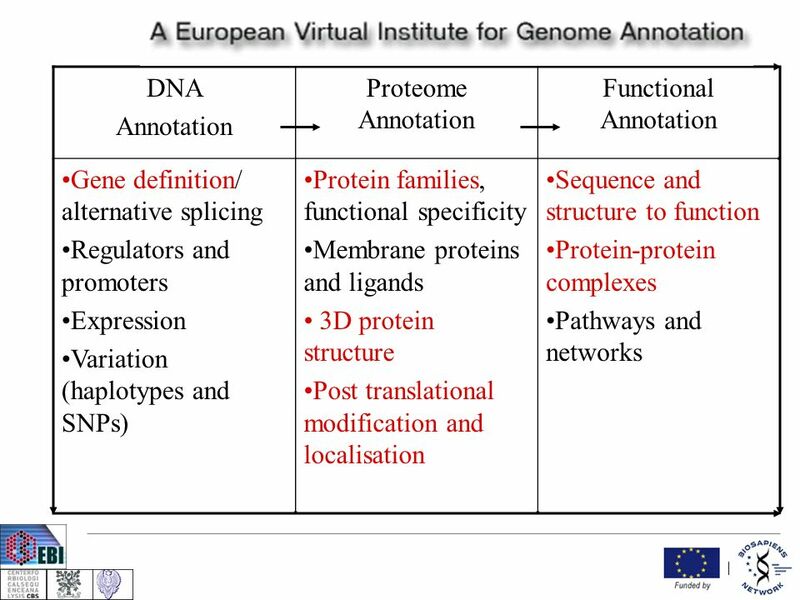 Protein Annotation Ontology The BioSapiens Virtual Institute for Genome Annotations Janet Thornton & Gabby Reeves AFP/BioSapiens Vienna: July 07. CSE/Beng/BIMM 182: Biological Data Analysis Instructor: Vineet Bafna TA: Yuan Zhao Course Link Course Link. MICROBES Grand Challenge in Comparative Endocrinology. EU RTD + FP Cancer Treatment: A priority for patients in Europe 7 th European Health Forum Bad Gastein 7 October, 2004 Cornelius Schmaltz MD European.  Preparing undergraduates to succeed in college and beyond in a bioinformatics-rich curriculum  Discussion of existing resources, opportunities, and. The European Molecular Biology Laboratory (EMBL) is supported by sixteen countries. Consists of the main Laboratory in Heidelberg (Germany), Outstations. 1 23/05/2015 Networking Research Infrastructure NCPs National Hellenic Research Foundation (EKT/NHRF) Project Monitoring & Coordination Unit EuroRIs-NET. BI420 – Course information Web site: Instructor: Gabor Marth Teaching. 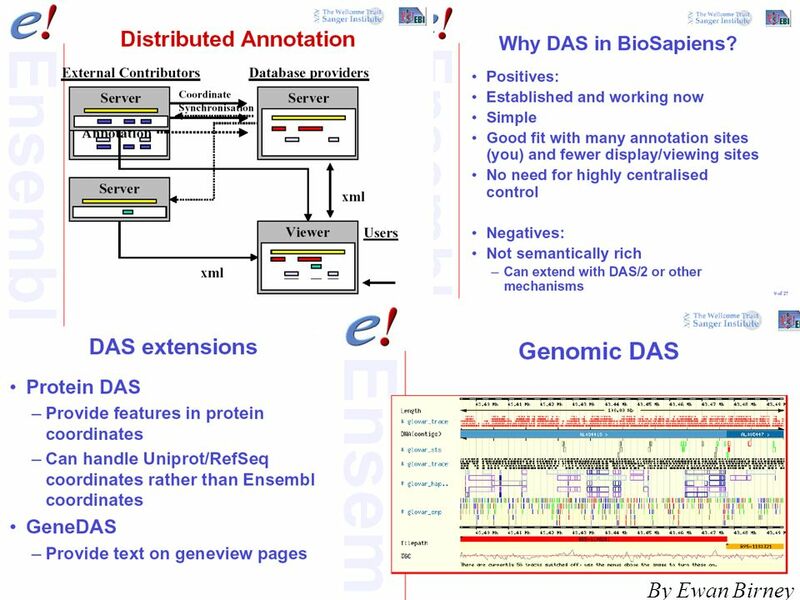 Bio/CS 251 Introduction to Bioinformatics. Class Web Site This site will contain all important documents. EoI assesment and presentation NCP 24 October 2002 Confronting the major communicable diseases linked to poverty Health Directorate F3 unit: Poverty related. Human Genome Project Seminal achievement. Scientific milestone. Scientific implications. Social implications. Presented by Karen Xu. Introduction Cancer is commonly referred to as the “disease of the genes” Cancer may be favored by genetic predisposition, but. Institute of Cancer Research - Institut du cancer ICR’s Activities in Cancer Imaging. Valentina Di Francesco Senior Program Officer for Bioinformatics, Structural Genomics and Systems Biology Microbial Genomics.